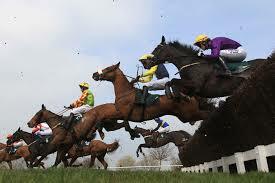 It's Cheltenham Festival week, so SubScribe is sponsoring a steeplechase. The winner will be the paper that squeezes the news hardest to give maximum space to encouraging people who probably can't afford it to invest what little money they have on horses that probably won't win. 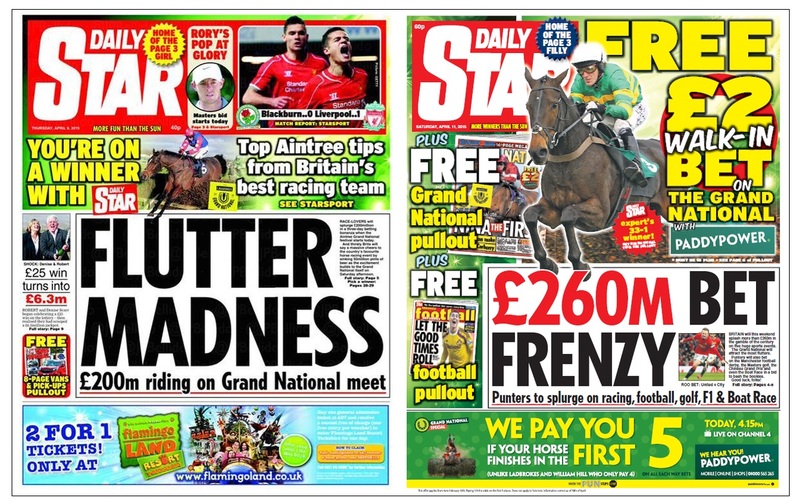 There are five entrants so far and they will have to go some to match the Daily Express's Grand National record last year, when it beat the Daily Star by a short head in managing to do away with the news altogether. The Star, however, set a record of its own with the shortest splash heading of all time. As the runners entered the paddock on Monday, the Star was showing the class you'd expect of the favourite. There was just a single line for Cheltenham, but it had marked rivals' cards in a huge self-promotion at the top jeering at the Sun, Mirror and New Day. The splash had already been reduced to less than a third of the page - and even then it found room for a naked couple "romping". The Mirror and Sun barely tried with conventional puffs at the top, while the Express kept its powder dry pretending the festival didn't exist. Approaching the starting gate on Tuesday, the Star was still in mocking mood, and it was already focusing on the prize. A free £10 bet, a free 12-page pullout and a Paddy Power ad meant the splash was reduced to 14.5% of the front. 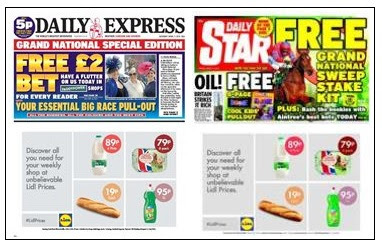 The Sun, Mirror and Express all gave half of their pages to their lead stories, The Express sandwiched its report on old age (with obligatory picture of Her Majesty) between its pullout/free bet promo and the same Paddy Power ad as its sister. The Mirror had a bigger pullout, but was offering readers only £5 to squander. The Sun didn't seem to have its heart in it, with a smaller puff for a £1 bet and no supplement. 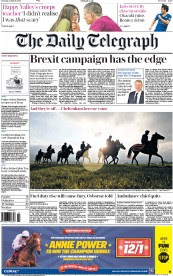 The Telegraph turned up with a big picture of horses taking their early morning exercise and a solid Coral ad, but no one sees the paper as a real contender. Betting update: Daily Star 1/5, Sun 2/1, Express 7/4, Mirror 5/1, Mail 25/1, Telegraph and Times 100/1, Guardian 200/1, Independent 500/1. The Sun and Star came storming out of the stalls on Wednesday as the race finally got underway. The Sun produced some surprise tactics with its unsavoury lead story which meant that, with its 16-page supplement and the promise of a £1 bet, Cheltenham occupied more than 90% of the front - but the splash was still a proper size. Hot favourite the Star also found a lead "story" at the festival that allowed it to use a picture of a woman's breasts. At 17.5% of the front page, the splash was bigger than Tuesday's, but there was still no room for anything other than the racing and self-promotion on the front. The day's special offers were a 12-page pullout and a £2 bet, with a Paddy Power ad completing the package. Making an unexpected early showing was rank outsider the Independent, with a Ruby Walsh picture that took up nearly half the front and reduced the Syrian splash to just 17% of the front - making it the smallest of the day. Tipsters remained doubtful, however, that the Indie could last the course on this its last outing before it is put out to pasture (aka sent to the knacker's yard) at the end of the month. Lurking behind the front-runners, the Mirror had ground to make up with its splash marginally bigger than its Cheltenham puff - a £5 bet and 12-page supplement. The Express meanwhile called up its royal horsewoman Zara Tindall to bolster its £2 bet and "essential" pullout, but it was clearly pacing itself. Watch out for big ads to push it towards the front as the race progresses. The Telegraph was already depending on advertisers to keep it in the race, with another Coral ad taking up a fifth of the front. SubScribe particularly likes the bit in yellow that says "When the fun stops STOP". The Express's festival guide was "essential". The Mail, showing a desultory interest in the chase, dawdled out of the starting gates with a banner offering an eight-page pullout which was, of course, superb. 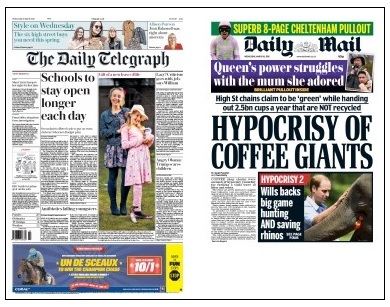 Tennis and hypocrisy are far more to the paper's taste than racing - unless the Queen happens to be watching the horses. As the runners approach the scary Budget fence, there could be quite a shake-up among the leaders come Thursday before the final Gold Cup straight on Friday. The Star soared over the Budget jump without any change of pace, landing with another 17.5% splash, and the Mirror gained ground by increasing the puff and cutting the splash to just half the page. It also added value to the promo, supplementing the free 12-page pullout and £5 bet with "all the silks, all the tips, all the form". The Sun slipped back, unable to resist the opportunity of putting a woman in a bathing costume on the front alongside the Chancellor. The Express also lost ground without a "filly" to hand. It was also probably distracted by the anti-Europe twigs sticking out of the Budget fence. The Mail, still failing to show any form, went from offering a "superb" pullout to a "brilliant" pull-out, complete with new hyphen. It clearly wasn't focusing properly. The Express's supplement remained "essential". The Telegraph maintained its pace thanks to the Coral ad, but, as many had feared, the Independent was a faller. With just the Gold Cup straight to go, the Star seems to be cruising home. In the end it was a two-horse race with the Sun well beaten into third by the fast-finishing Mirror. But no one could touch the Star, which passed the post with a well-below-its-best 13% splash. The Mirror, improving on the home straight, came in at 35%. Disappointed punters pointed to the bigger headline and smiling Cameron and Osborne pictures, which cost the Mirror dear, but the Star was unmatched in all areas, squeezing in a heading, subhead, Wayne Rooney photograph and a pair of flags and 33 words of text. The Mirror indulged in twice as many words. The Sun was distracted at the last by the lottery, yet still managed to achieve a page on which 91% of the available space was devoted to promoting the joys of gambling. In the competition for the most space devoted to Cheltenham - the equivalent, perhaps, of the best turned-out horse - the Mail put on a late burst to eclipse the Express, and almost match the Star. The Desmond stable runners both produced bigger puffs but squandered space on attacking rivals. 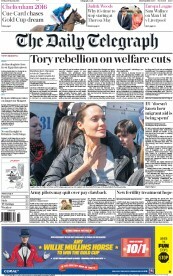 The Mail also ran past the Telegraph, which tried its best with a combination of ad and puff to reach 27%. The i came out of nowhere to trot up to the finishing post in seventh with a cheeky little Victoria Pendelton puff that completely ignored the Gold Cup. The race may be over, but what's the betting that even Shrinking Splash non-runners will show their colours in the winners' enclosure tomorrow? In case you hadn't realised, that's what this is all about. Sport is one thing, but all these acres of newsprint aren't being filled with sport. They're being used to promote gambling. Imagine these levels of front-page space given over to booze offers. Gambling is every bit as addictive as alcohol and has an equally devastating effect on families. Who could put it better than the Star in the run-up to last year's Grand National? And even then, without a hint of irony, it put a little lottery story on the left to up the ante. We've got all this to come next month. I can hardly wait.